Blackjack is one of the most popular card games, played online and in land-based casinos throughout the world. While some tout it as the card game for mathematicians, intellectuals and those who are drawn to the allure of beating the house, blackjack is really a card game that anyone can play! It’s not just card savants, maths geniuses and mere mortals that enjoy playing Bingo for money and other such games that are attracted to the adrenalin-pumping action of blackjack. Celebrities who have cash to burn are well known for seeking out different avenues to turn their money into thrill-inducing experiences. It was during his time doing research for the film Rounders that Matt Damon first became interested in the fast-paced and high stakes world of blackjack. His best friend Ben Affleck (featured next on the list) may have had something to do with his fascination with the game and he has since become a notable player around the blackjack table. These bosom buddies are regular fixtures at high stakes blackjack tables in Las Vegas and Atlantic City casinos. One of their more infamous gambling escapades occurred at a Hard Rock Hotel and Casino in Florida where the duo raked in close to a million dollars in a single night. While there’s no denying that Matt Damon has picked up some tips from Ben Affleck, the Good Will Hunting star has continued to up his game and is rumoured to have gambled using Bitcoin which is said to have made him a fair bit of profit. Ben Affleck’s love for high stakes casino card games is no secret. The Academy Award-winning actor is known for his poker prowess, showing his skill in 2004 when he won the California Poker Championship. 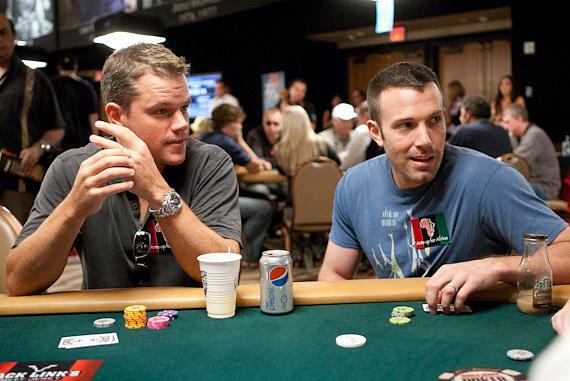 However, it is Affleck’s love for blackjack that has drawn the most attention from the public, especially when he’s teamed up with close friend, Matt Damon. It was reported that Ben Affleck was kicked off the blackjack tables at The Hard Rock Hotel and Casino when he started winning too much (a reported $95,000 in a single sitting). The star later admitted that he had dedicated a massive amount of time learning card counting and expert blackjack strategy. Tiger Woods was the most prolific professional golfer of his generation before a very public fall from grace due to his personal affairs. His prowess extends off the golf course and he is known to enjoy high stakes blackjack games at the Bellagio and MGM Grand Resort where he enjoys VIP treatment and credit rumoured to hover around the $4 million mark. UFC president, Dana White has been quite vocal about his love for high stakes blackjack. He has been reported bragging to the media to have won as much as $5 million playing blackjack, an amount which he says requires him to bring his own trash bags to carry his winnings out the door.